at Chambers Bay also in Washington State. Romain Wattel lead a dominating performance by the 7 Frenchmen validating their world rankings and leaving no doubt as to the rise in stature for golf in France. 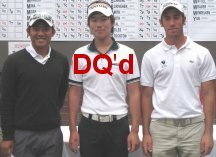 Completing the sweep of the top 2 spots by foreigners was Taiwan's Cheng-Tsung Pan who will be a Freshman at the Univ of Washington in 2011. Finishing third was Hawaiian, Chan Kim who continued his stellar play this summer before he turns pro after the US Am. In the fourth slot was Max Homa of Cal Berkeley who is establishing himself on the national amateur circuit. The top Aussie was Jason Scrivener tied in the fifth spot with local favorite, Cameron Peck who finished fifth last year. Canterwood has an outstanding and tough course for testing world class players at any level. Unknown native Korean Woo-hyun Kim was the Champion as of the end of the event but it was subsequently determined that he was a professional at the time. As such, Woo was disqualified post-event under the USGA Rules of Amateur status.